Hold your left hand in a fist and then spread out the thumb, first finger and second finger so that they are at fight-angles to each other. Point your First finger in the direction of the magnetic Field (from N to S). Rotate your hand about that finger until your second finger points in the direction of the Current (conventional current, from + to -). Then your thumb points in the direction of the Movement of the wire. We can use this idea to make a motor:if we put a coil of current carrying wire into a magnetic field it will spin. Motors use split-pin contacts so that the coil will spin: this means that a coil will make half a turn, upwards for example, and then touch the opposite contact which will make it spin downwards. Otherwise the coil would only make half a turn. Test this with your left hand rule! Alternatively, if we spin a coil of wire in a magnetic field, a current will be induced in the wire. These generators produce AC current. 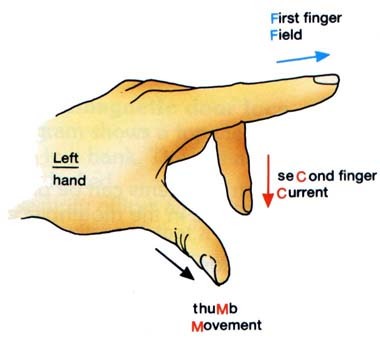 You can predict the direction of the current using Flemming's Right hand rule. It has the same fingers as the left-hand rule. Use it to see why the generator produces AC current.